Need more information about booking Property 5354359 ? Villa Ulun Mertha is located in the village of Penestanan Kelod, which is about 5 minutes drive or 40 minutes stroll to Ubud center, It's set in the middle of Penestanan's ricefield 600 metres from the main street yet the best location if you're looking for relaxing place from busy ubud but not far from Ubud. the villa can be accessed by motorbike and private parking is available. Rate includes daily breakfast and internet. 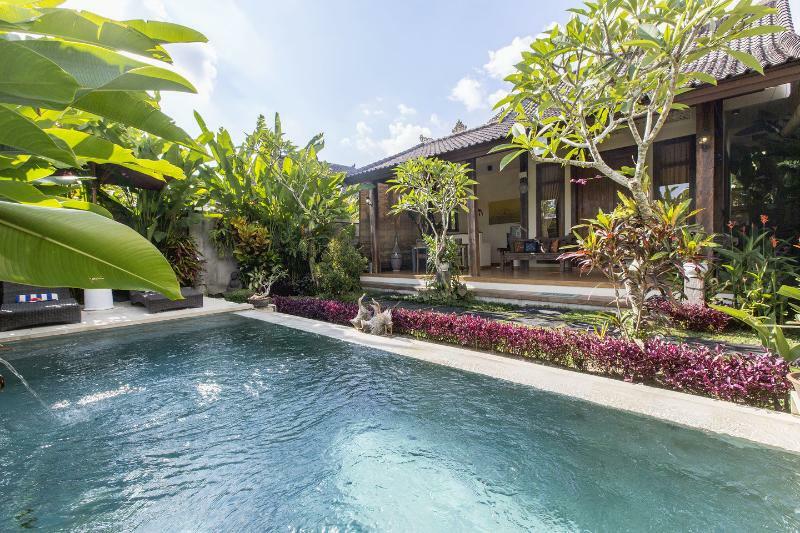 Villa Ulun Mertha is self-contained one bedroom villa with private pool surrounded by tropical garden, It has airconditioned bedroom and semi open ensuite with beautiful bathtub. The kitchen is fully equipped and the whole villa is fully furnished with carved wooden furniture. Once you enter the beautiful Balinese style gate your privacy is assured. This place is truly a gem. I stayed here for 3 weeks in April. It's in the middle of the paddi fields yet it is a short walk away from the main road in Penestanan. The villa is beautiful and it was great to come back to have your own pool and small kitchen and beautiful bathroom. My only recommendation is that the villa make available the following: - access to a motorbike/driver during the stay as it is dark and difficult to walk back at night - a local mobile phone so that you can ask questions and stay in contact with the villa management if you have to ask a question. As this villa is by itself, if something goes wrong, there was no way to contact them. Luckily they gave me a phone when I asked for it as one night, the gas in the kitchen ran out and it had to be changed immediately. - a small booklet letting guests know what they can do in the surrounding areas, amenities available such as restaurants, phone numbers, yoga studios, shopping, laundry services etc. - provide mosquito coils for the outdoor area and electric coils in the bedroom as there are alot of mosquitoes around. I had to buy my own. - provide a fan in the outdoor area as it can get very hot when the air is still. - the internet is somewhat spotty but it could just be Indonesia though. Overall, I had a really pleasant stay and would definately stay here again when I return to Ubud. We stayed at villa Ulun Mertha last month and had a great time there, perfect location close to shops and cafes and we loved the walk to the villa. It's a beautiful villa, Wayan the owner is really nice and so helpful, he keep the villa really clean. love the stone bathtub!!! we will be back! You can get in touch with Karu (the owner) through the contact form on this page. Send Karu (the owner) an email through the contact form on this page. Alternatively, if there’s a phone number on this page, you can call them. How do I contact Karu (the owner)? If you’ve already booked, go to Manage your booking to view Karu the owner's contact details or send them a message. Or send Karu (the owner) an inquiry through the Contact the owner/manager form if you’d like a quote or more info first. When you pay online through the Ready to book? form, a booking request is sent to Karu (the owner). You’ll find out within 24 hours whether they’ve accepted - no money will leave your account before then. You can also request a quote from Karu (the owner) through the contact form. The owner will email you the total cost for your dates and a link to book and pay online. Use the Ready to book? form to pay provisionally online. You can pay by credit/debit card or PayPal. Karu (the owner) will have 24 hours to accept the booking and no money will leave your account before then. Why can't I call Karu (the owner) before booking? You’ll need to contact Karu (the owner) to do this. Send them a message in Manage your booking or through the contact form on this page. You can request to change the dates or number of people on your booking via the Manage your booking page. To change your dates use the Edit booking button. If you need to change the number of guests staying then send Karu (the owner) a message. If Karu (the owner) agrees, they’ll send you a revised quote outlining the changes. You can review and accept/decline this from the Manage your booking page. You’ll have 48 hours to take action before the revised quote expires.